The listeners of the Fly Fishing on the Web podcasts have been suffering through some fly tying tips, voiced by yours truly. Since the tips exist in podcast format, I might as well feature them here also, so please indulge me. The first tip recorded was about thread control. 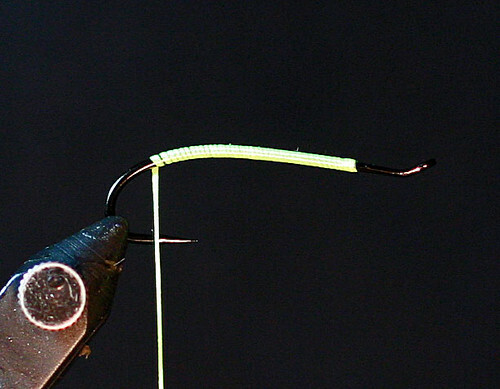 When we tie a fly, we put a twist in the thread with each orbit around the hook shank. After 20-30 revolutions, the thread gets twisted into a tight rope. The twisted thread makes it more difficult to build a smooth base, and makes it really difficult to create a soft loop to tie in materials. The soft loop collapses and twists up on itself. See the thread in the rear is wound tight. (I used uni-stretch for this photo). Right-handers can unwind the thread by spinning the bobbin counter-clockwise. Left-handers, like much in life, you are on your own to figure it out (I imagine spin clockwise, but this is left as an exercise for the left-handed reader). Also, you can just let the bobbin hang for a while, it will unwind on its own.